Calci-Chew D3 1000 mg / 800 I.E. How is the medicine used? When should you not use this medicine? Calci-Chew D3 contains calcium and vitamin D3; substances that are important for maintaining strong bones. Doctors prescribe this medicine for the treatment (or prevention) of osteoporosis. You can order Calci-Chew D3 online at the pharmacies that work with Dokteronline.com. Calcium plays a major role in bone formation. This mineral ensures that the bones have a solid structure so that they are well-tolerated and remain stable. The body extracts calcium from nutrition, such as dairy products, nuts and vegetables. In that process, vitamin D3 (cholecalciferol) is required; the substance that allows the body to absorb calcium from these foods. Sometimes it is necessary to take extra calcium, for example, if you suffer from osteoporosis (bone loss). In this condition, the bones do not absorb enough calcium, causing them to lose their density. This increases the risk of bone fractures and collapsing vertebrae. Osteoporosis can, for example, arise from age, a poor diet and a lack of exercise. People who don't get out of doors much are also more likely to develop osteoporosis. Sunlight promotes the production of vitamin D3. People who are at greater risk of developing osteoporosis may use Calcichew-D3 to prevent their bone structure from becoming fragile. 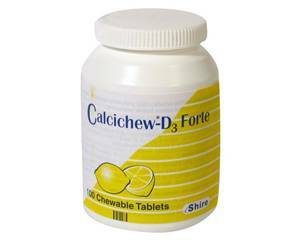 Calci-Chew D3 is also used to supplement the treatment of existing osteoporosis. In addition to calcium, the tablets contain vitamin D3 to promote a good calcium uptake. Calci-D3 is also great for people who spend little time outside and are not sufficiently exposed to sunlight. You can buy Calci-Chew D3 online at participating pharmacies. You can swallow the tablets, chew them or let them melt in the mouth. The tablets can be taken with or without food. A doctor will decide how long you should continue to use this medicine. Adults: 1 chewable tablet each day. Observe the prescribed dose. Calci-Chew D3 is not suitable for children under 18 years old. Read the Instructions before use. Gastrointestinal disorders (stomach ache, belching, acid eruptions, nausea, flatulence, diarrhoea). If you get any of these or other side effects, talk to a doctor or pharmacist. Are allergic to calcium, vitamin D3 or any of the excipients in the tablets. Have excessive vitamin D3 or calcium levels in your blood. Consult a doctor if you are suffering from other health problems or if you are taking other medicines (see leaflet for more information). Use Calci-Chew D3 only if you have a calcium deficiency, and only on the advice of a doctor if you are pregnant or breastfeeding. Too much calcium can be harmful to your baby. There are no warnings for driving or using alcohol.